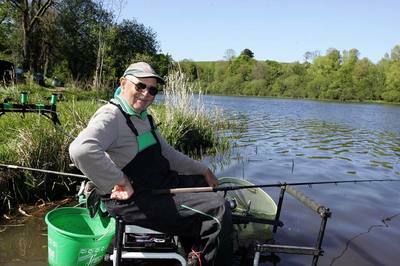 Making good use of the excellent wild coarse fishing in County Leitrim two new festivals have been announced for 2018. Drumcoura City, of Cowboys' & Heroes fames sits on Drumcoura Lake and has well equipped self catering on site, and offers for the first time this June the Ultimate Match Angler festival. Carrigallen is your base for the Kilbracken Club Anglers Challenge also in June; with the overseas club angler in mind this festival combines match entry fees with accommodation & dining all based around the Kilbracken Arms Hotel. 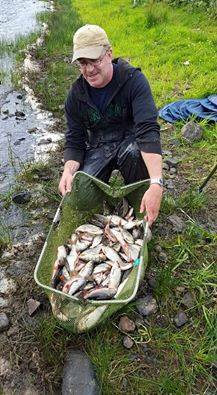 Irish up and coming angler Shamie Winters from County Monaghan wins the Ballinamore Festival. Shamie fished a great festival with some good weights against tough competition which saw him take the lead on the final day with a 12kg catch at Connolly's Shore finishing with just under 50kg in total. 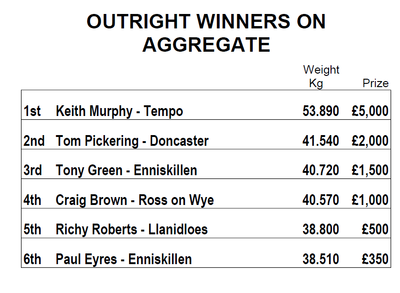 Enniskillen Angler Tony Green's 7.250kg from Lough Scur wasn't enough to keep the top position he held all week and he finished second with 45.830kg. 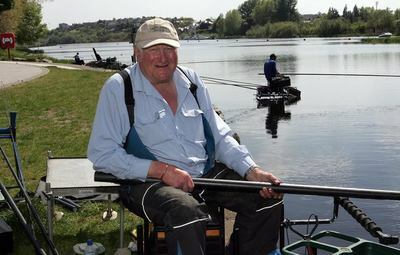 Runcorn angler Dave Stewart finished in third place with 49.470kg. In 4th was Wayne Fuller and 5th Mark Harris. Katrina McGirr from sponsors Waterways Ireland presented the trophy and cash prize of €1000 to Shamie at the presentation evening at Terry Shorts Heritage Bar. The top five also received cash prizes along with numerous section winners. 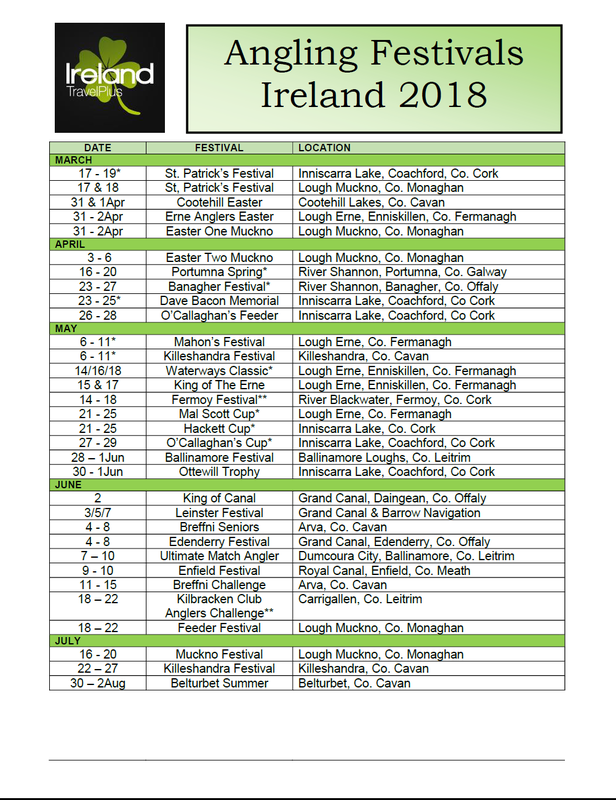 ​The Festival next year will take place from Monday 28th May to Friday 1st June 2018. The 2017 Wterways Ireland Classic Fishing Festival is won by local anglers Keith Murphy with a great catch of 36kg 40gms on Friday at Cleenish Bridge. Keiths total weight over the three days of the 53kg 890gms netted him the winners cheque of £5,000 and the coveted Crystal Chalice. ​In second place overall was Doncaster Angler and Manager of the England Feeder Team, Tommy Pickering, a previous Classic winner, whose total of 41kgs 540gms earned him £2,000 and the runners-up crystal. 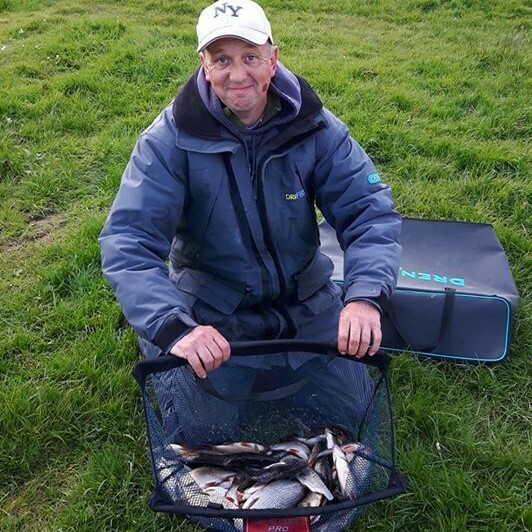 In third place was another local angler Tony Green with a total of 40kg 720gms which landed him £1500 and a crystal sports trophy. Fourth overall was Craig Brown from Ross-on-Wye whose 40kg 570gms was enough to secure him £1000 and a Belleek trophy. Filling out the top six were Richy Roberts from LLanidloes with 38kgs 800gms and another local angler Paul Eyres with 38kg 510gms. ​The winners of the hotely contested team event, the Waterways Ireland Masters, were the 'Team With No Name', with 'Dads & Lads' second and 'Two Postman Pats and a Couple of Sprats' in third place. ​The Classic is sponsored for the fifteenth year by Waterways Ireland and is organised by Fermanagh & Omagh District Council in conjunction with the Inland Fisheries Division of the Department of Agriculture, Enviroment and Rural Affairs. 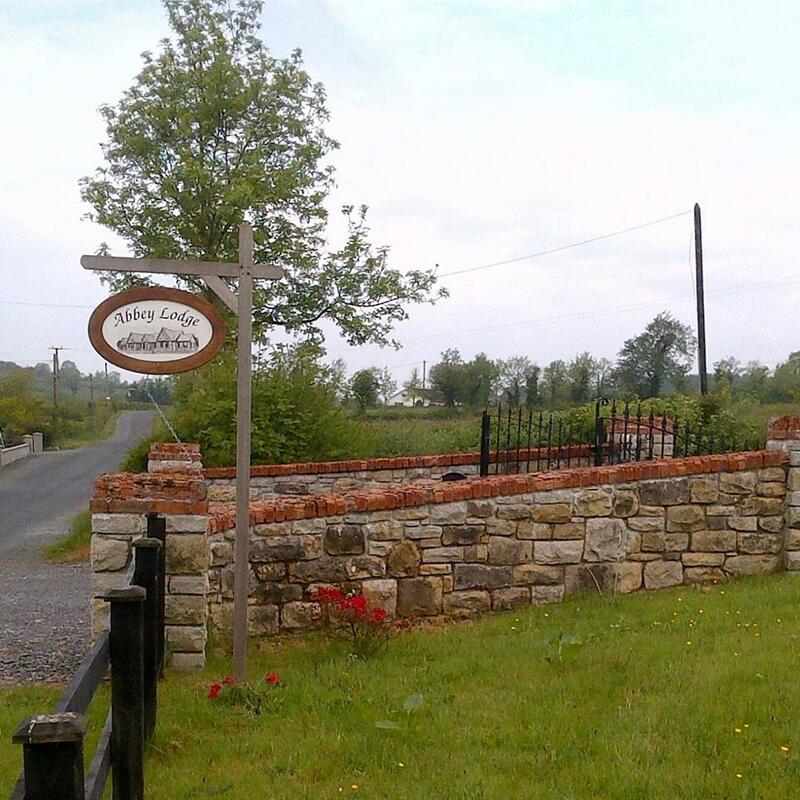 We found this little gem in the Leitrim countryside recently when Steve & Sonia at Abbey Lodge, Fenagh welcomed us to their super property, a top quality B&B. Fenagh is a super spot, just outside Ballinamore and ideally situated for the fabulous variety of angling in Leitrim and of conveniently located for the World Pairs Angling Championship Ireland.But the icing on the cake is Steve himself who has been fishing in the region for over 30 years and has the property kitted out to suit the angler on holiday. 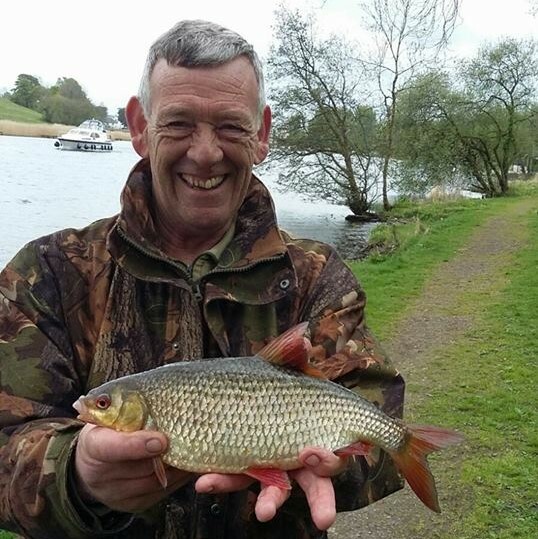 Steve is more than happy to bring you out to the venues and will willingly share tips and advice either, whether its on the bank or over a pint of black stuff! He is well conversed with the craic and knows exactly what we want for our Irish angling holiday! Monday saw the commencement of the 2017 Classic Fishing Festival in County Fermanagh, the forty second year of Ireland’s premier coarse fishing competition. 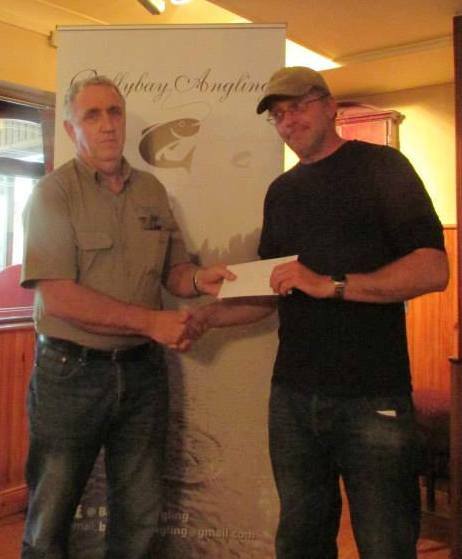 Two Hundred and forty anglers lined the sun-drenched banks of the Erne, each one hoping to net the week’s winning haul of fish that would land them the top prize of £5,000 and a crystal chalice, or some of the many other cash prizes on offer during the competition. Following day one of the competition, one angler has laid down the gauntlet to his fellow competitors, with a very impressive first day catch of 32 kg 590 gms. Fishing on the fancied Portora section, Ross-on-Wye angler Craig Brown netted £500 and a healthy lead for his efforts. 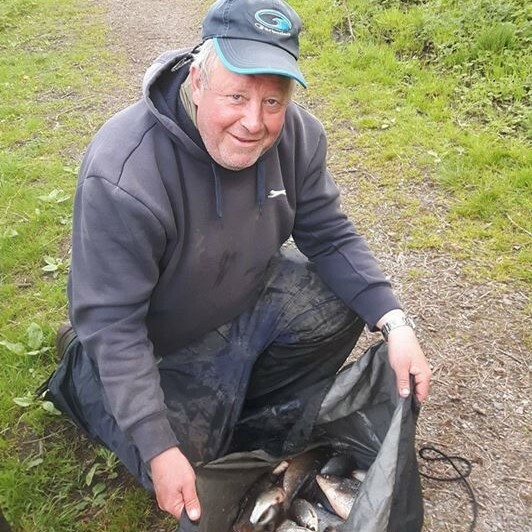 In second place after day one is Stuart Northop from St Neots with 24 kg 360 gms, caught at the Inishmore Viaduct Section. 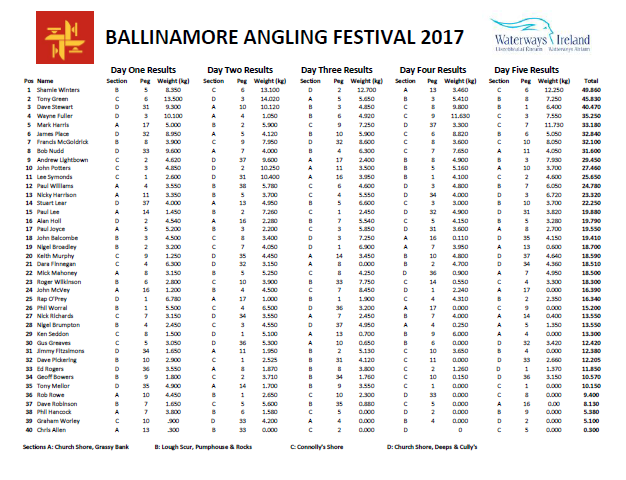 With the Broadmeadow and Killyhevlin sections fishing well, they have also produced the third and fourth spots on the results table. 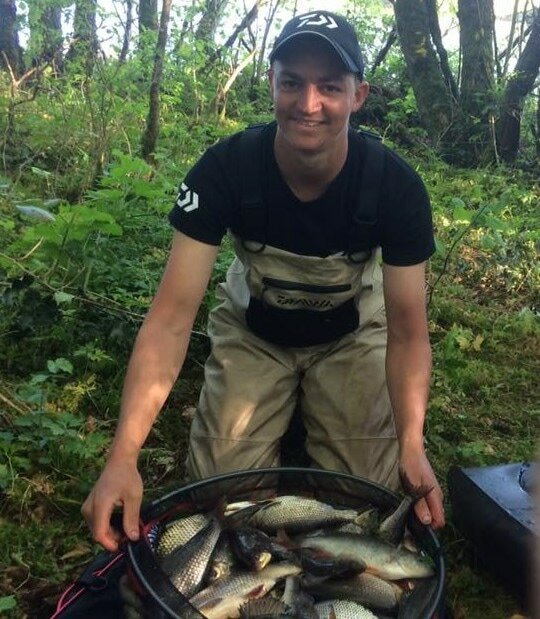 Another English visitor, Mathew Wise lies in third with 23 kg 780 gms from peg 1 at the Broadmeadow and Irish angler Dara Finnegan is fourth with 22 kg 070 gms from peg 4 at Killyhevlin. 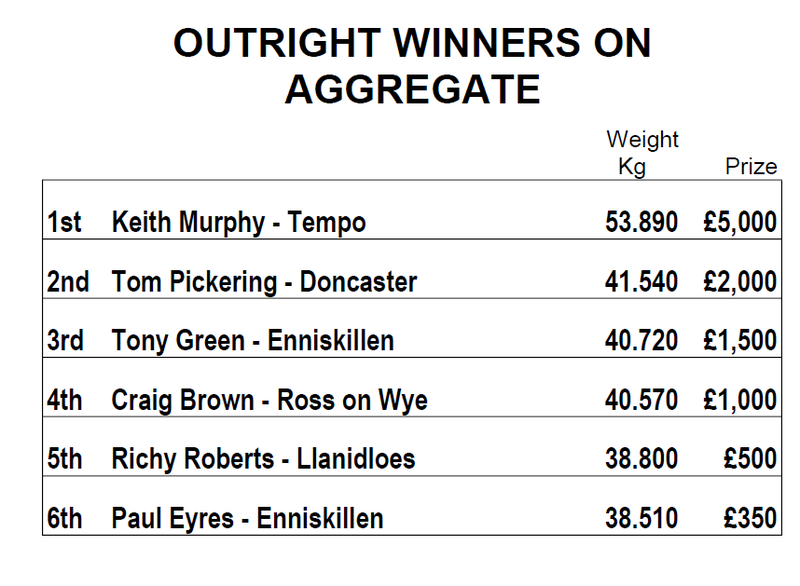 Top local angler is Keith Murphy from Tempo in 17 place, with a first day catch of 14 kg 540 gm from the Portora section. 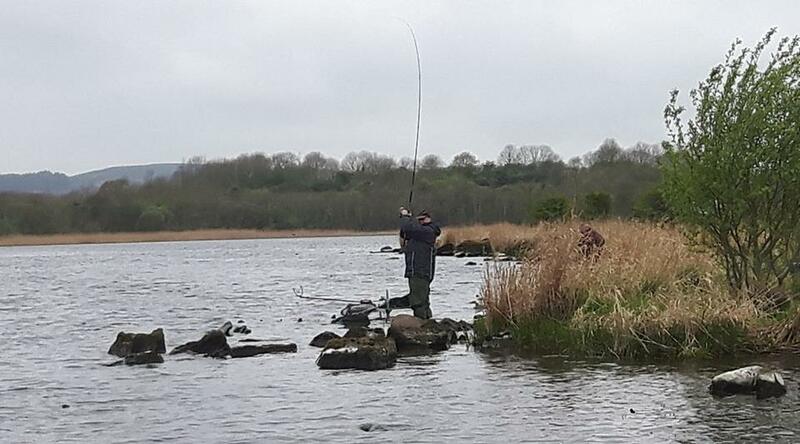 The weather conditions leading up the festival and the low level of Lough Erne were ideal for sunbathing rather than fishing, but the organisers are very pleased with the first day’s catches. 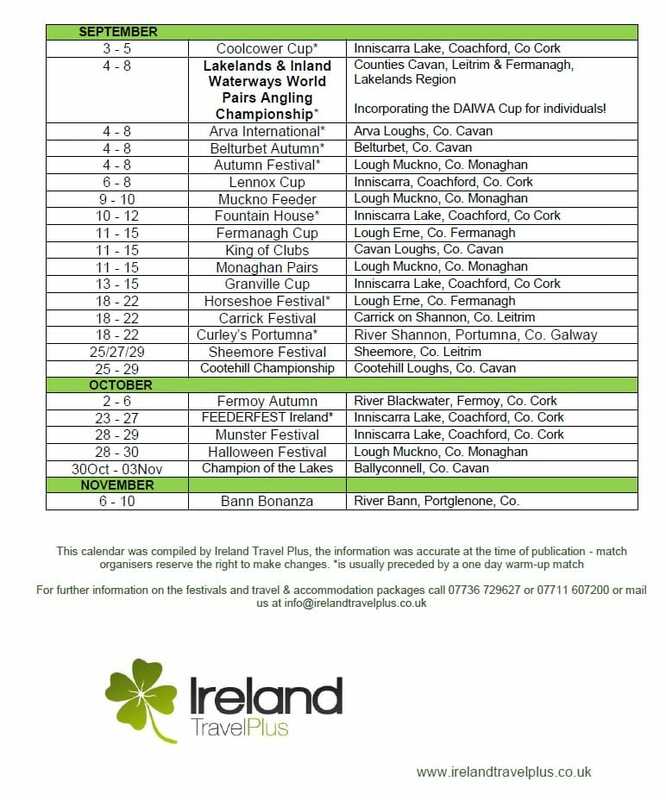 Expectations will be high for day two of the competition, when anglers gather for the draw at the Lakeland forum in Enniskillen on Wednesday morning. 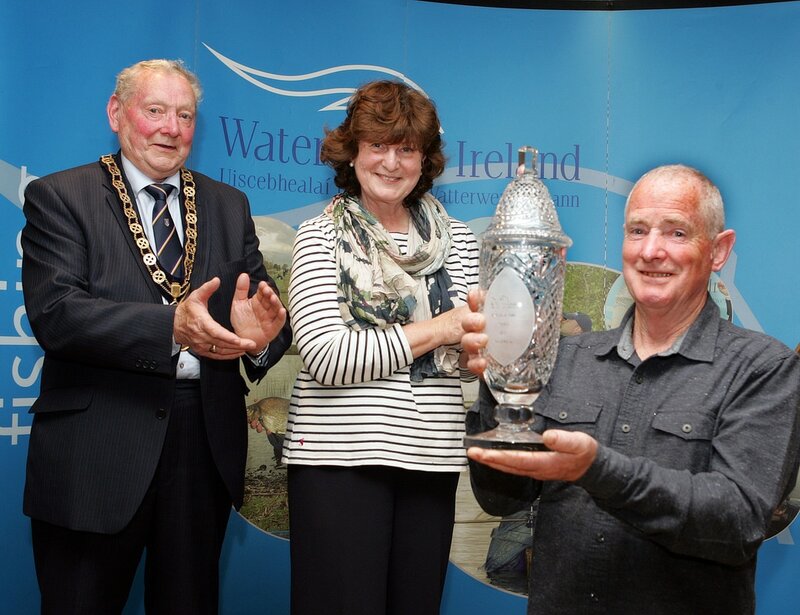 The Classic is sponsored by Waterways Ireland and is organised by Fermanagh and Omagh District Council, in conjunction with the Inland Fisheries Division of the Department of Agriculture, Environment and Rural Affairs (DAERA). For information contact Katrina McGirr, Waterways Ireland on +353(0)71 95 50560 or Eddie McGovern, Fermanagh and Omagh District Council on 0300 3031777. 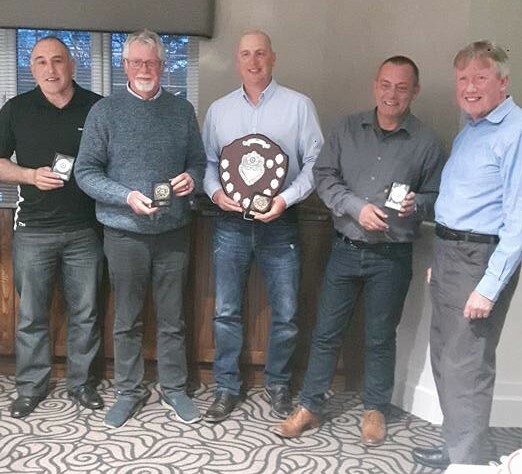 Our first guests in the new Lakeside Lodges at the Killyhevlin Hotel were the Fire Services National Angling section on their annual pilgrimage to Enniskillen for their Northern Ireland competition. 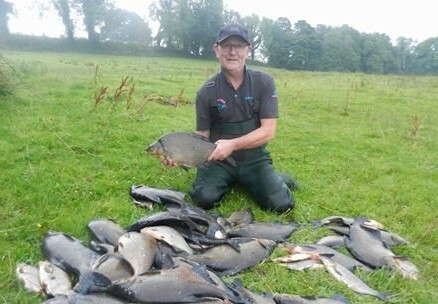 ​The 30 anglers representing angling sections from Hampshire, London, West Yorks, GMC, Herts, Merseyside and Cambs spent the week fishing the Erne competing in a two-day teams competition. 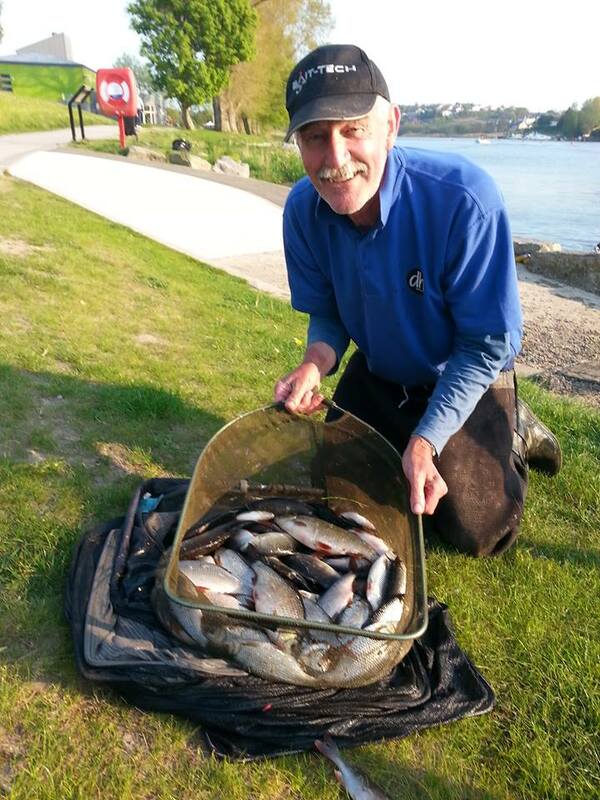 Lead angler David Rees reports that they enjoyed some of the best fishing and weather experienced in latter years. 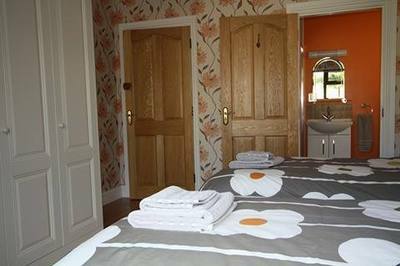 The new lodges are superbly equipped with plenty of space and the food and hospitality at the Killyhevlin Hotel is the best. 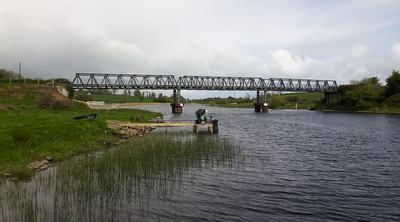 ​The competition was held on sections of the River Erne at Portora, Airport and Cornagrade with the group testing out new stands at Cleenish and Viaduct during their stay. 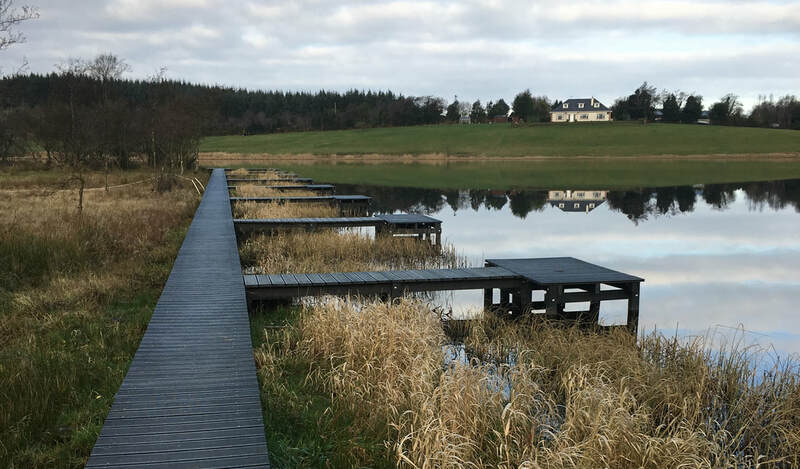 Then of course there are the jetties outside the lodges for some evening preparation. 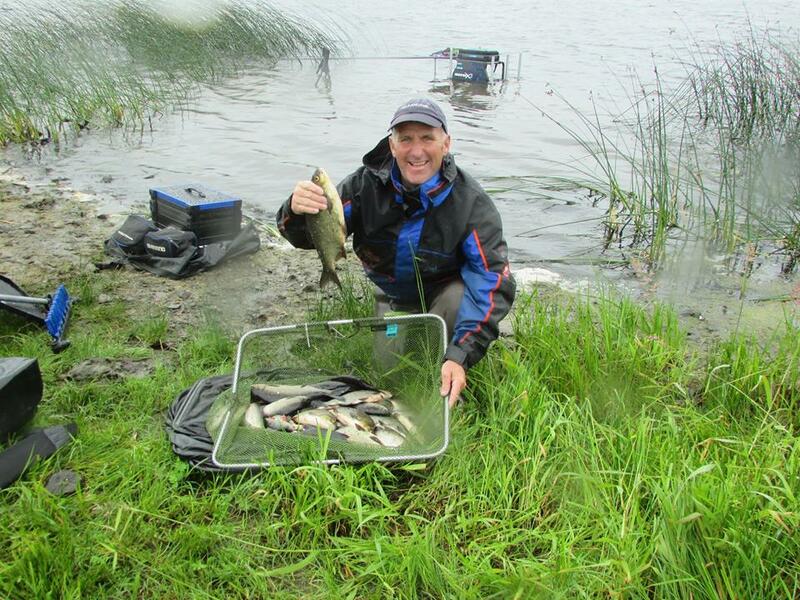 The group enjoyed good bags of roach and hybrids as they fished their way round Enniskillen and are already looking forward to next year! ​Congratulations to Hampshire who win for the second year in a row! 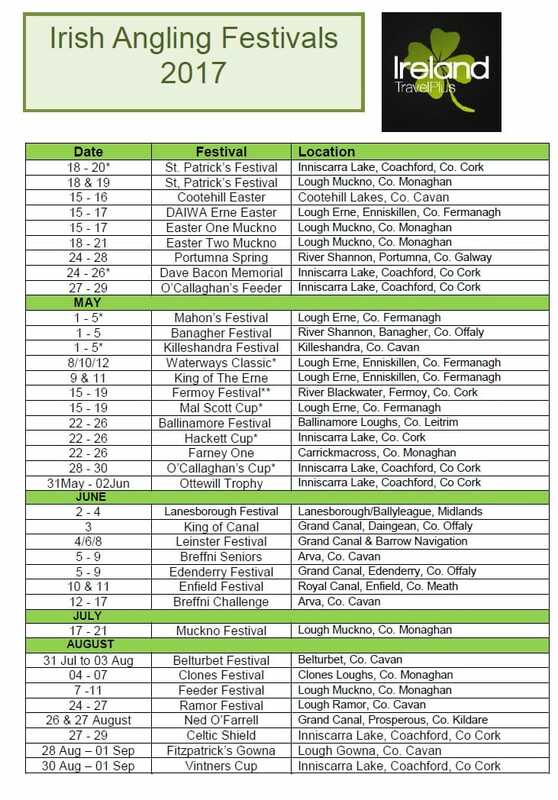 Almost 60 Festivals to choose from in 2017! You won't find anything like the Irish Match Scene anywhere else in the world. 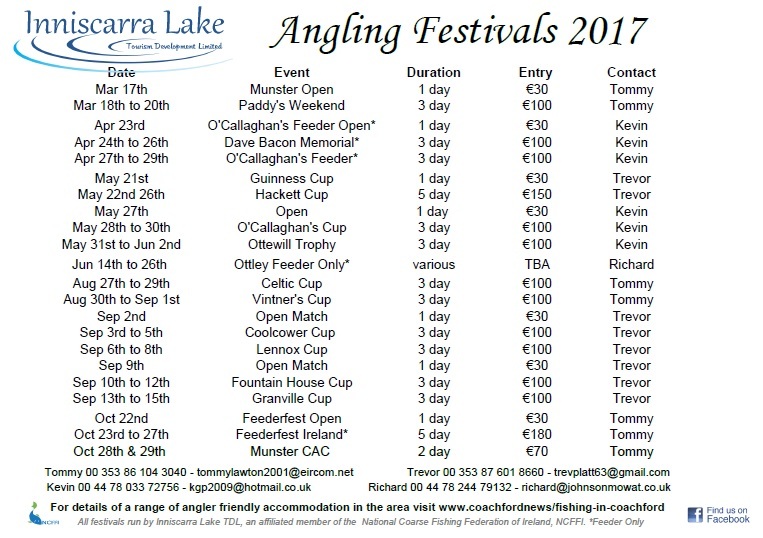 The challenge of fishing the magnificent wild waters along with warm Irish hospitality makes for the Irish Angling Festival and there are almost 60 to choose from in 2017! 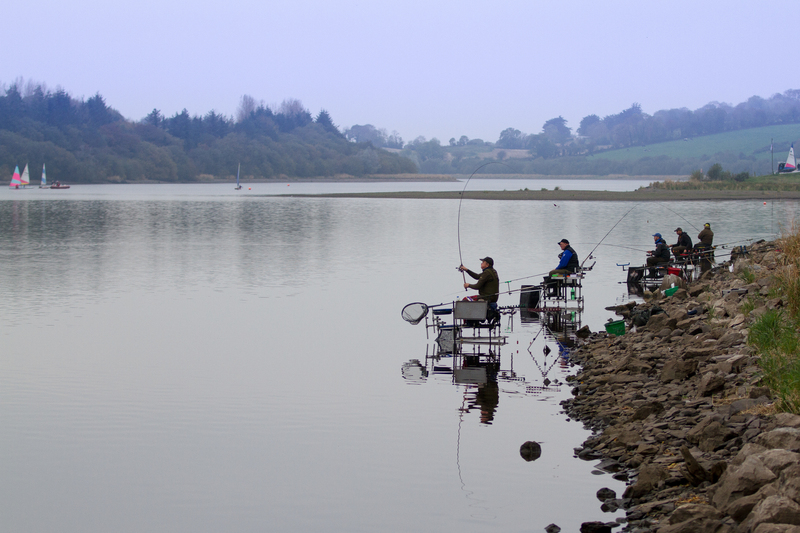 ​A programme of coarse angling festivals has been released for Inniscarra Lake Inniscarra Reservoir in County Cork Ireland. 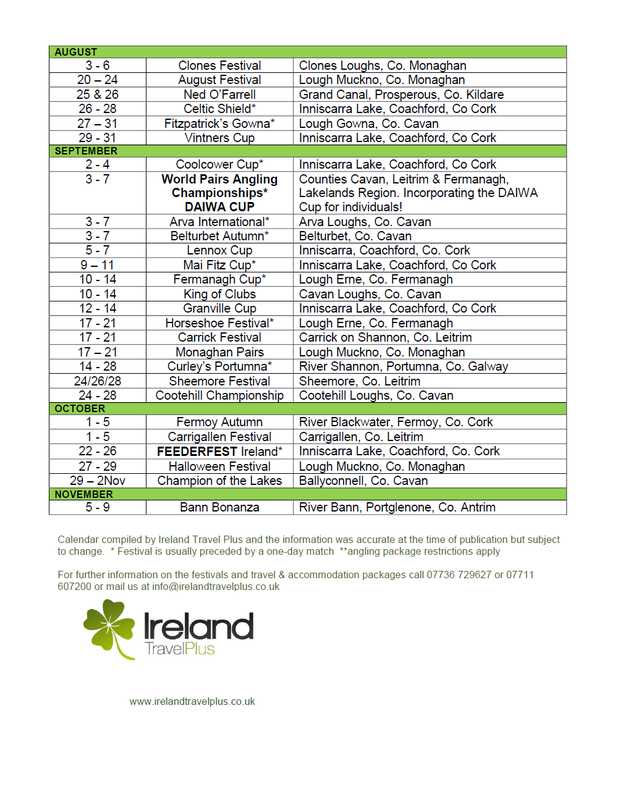 The programme includes the second edition of the successful FEEDERFEST Ireland which saw 100 anglers compete for fantastic prize money in 2016 with the added benefit of lots of Guinness! 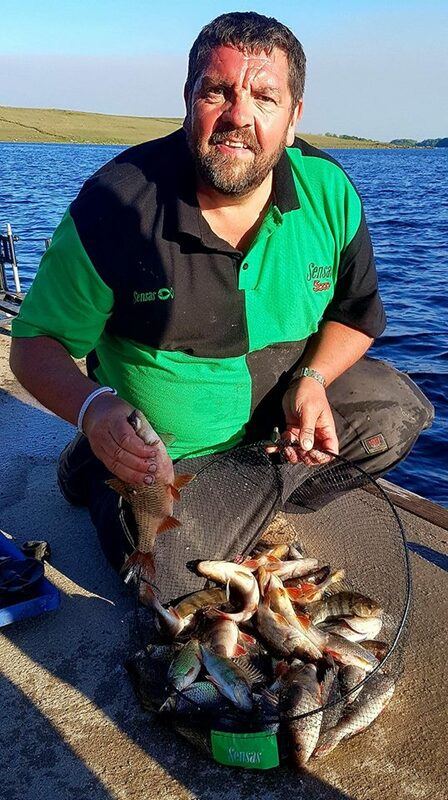 ​The prolific reservoir suits both the pole and feeder angler and of course is the well known venue of the World Feeder Championships of 2014 and home to Feeder Team England's first GOLD medal. As a result there are a number of 'Feeder Only' competitions being held with some April events too. 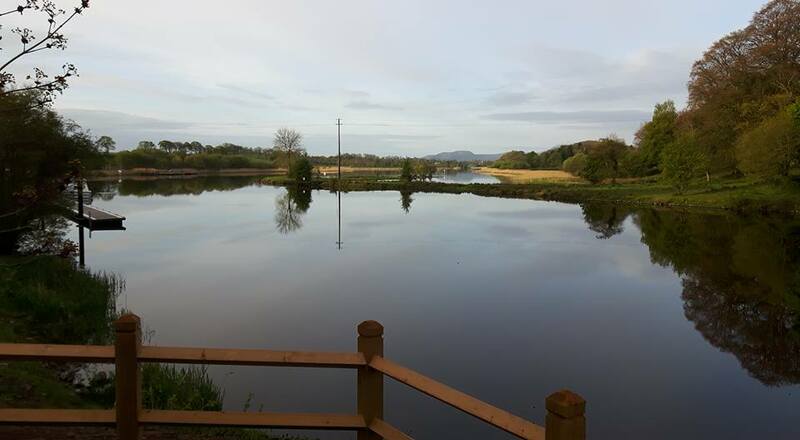 ​Inniscarra has a loyal following and you can expect between 30 and 40 on the majority of the festivals which can be combined to provide a weeks of match fishing in May & Spetember. The 3 day format of most with the odd one day open leaves the option to have a break where required. Sponsorship has not been released yet but most carry a decent supplement to the prze fund with 100% payout on entry. 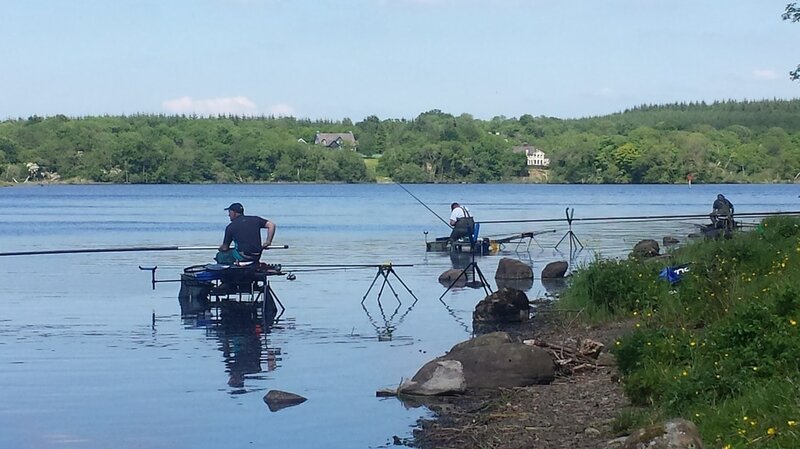 Note: a permit is required to fish the reservoir but these are readily available in Coachford. ​With such a large expanse of water there is still room for the pleasure angler when the festivals are on and most local acommodations have a key to allow vehicle access to the Greenway where you can pretty much park behind your peg. 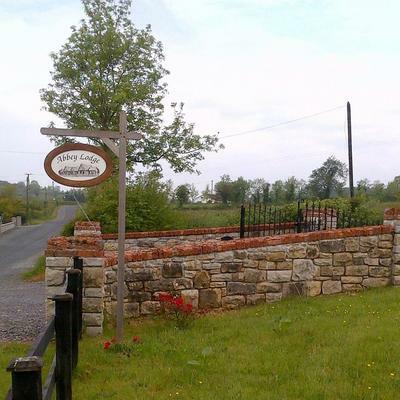 ​There is a range of accommodation available in Coachford and surrounding towns and villages such as Macroom and Dripsey all within minutes of the venues. Contact us for details. 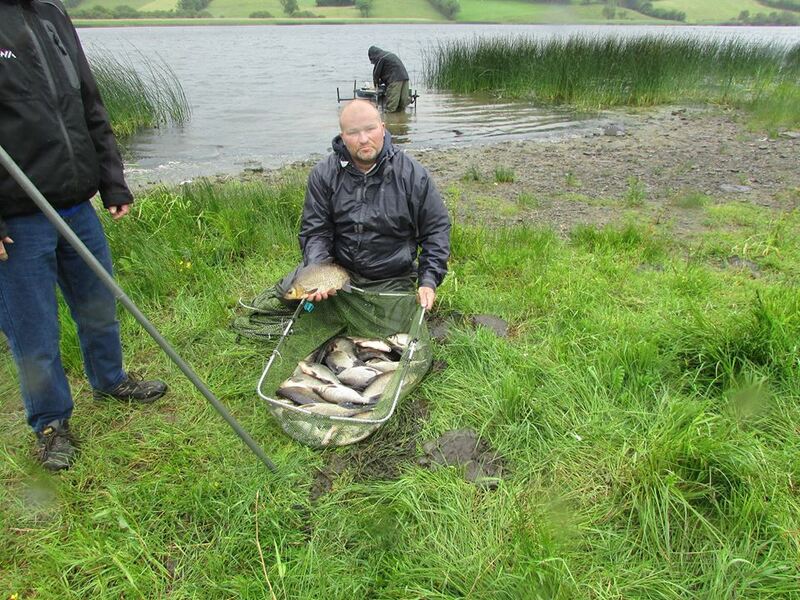 A super two day festival fished on the lesser known waters of County Monaghan. 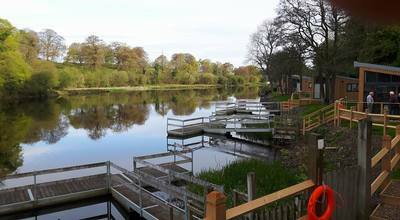 Known more for it's Pike angling the area has been overlooked in recent years by the coarse angler but is now regaining its popularity. There are numerous lakes on the Dromore system for the pleasure angler and plenty of clear shorelines suitable for match fishing. The 2015 festival held over the weekend of the 11th & 12th of July produced some great weights even though the locals tell us it wasn't fishing as expected. 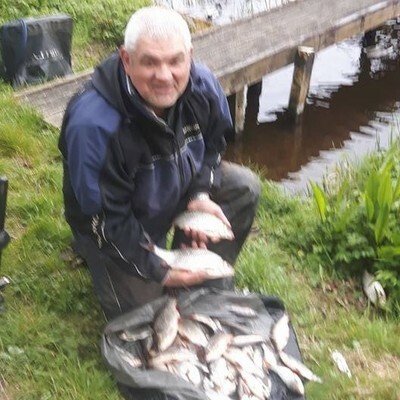 Mixed bags and some top weights of roach, perch, tench and some bream were caught on the Dromore system lakes of Drumlona, Bairds Shore, Bream Rock in section 1 and 3 stretches on Lough Egish for section 2. 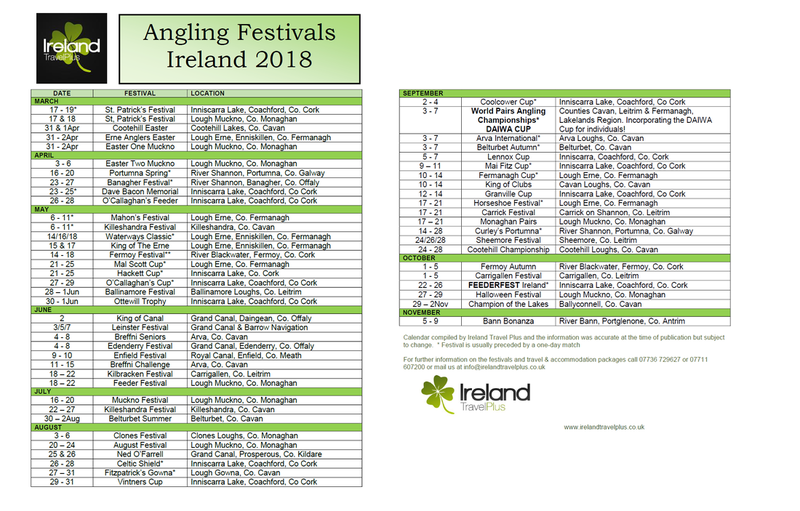 67 anglers from Ireland and the UK participated in the match a fine example of the Irish festival experience with fresh bait sold on site on Saturday morning and a few sore heads on Sunday. A total prize fund of over €4000 was paid. Some anglers will remember the week long Ballybay Festival which regularly attracted significant numbers of anglers to the region. 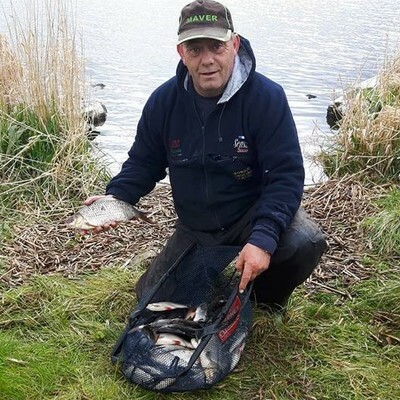 Ballybay Angling Association and their partners have announced that they will introduce a five day event 'The Ballybay Classic' following on from the 2-day festival in 2016. Sponsorship to top up the prize fund is currently being sought and details of accommodation in the area will be coming soon.